« I’m having money troubles. What are the best crystals to help attract abundance and prosperity? Life has been a process of refinement for many of us on the spiritual path. At the onset of spiritual awakening, it is common to feel a jolt of euphoric readiness to dive deep into the mystery. If you are like me, you wanted to read every book on every facet of metaphysics ever written, and you found yourself visiting one healer and psychic after the next to help piece together your soul story. I know I always wanted to progress quickly to the next level of understanding and intuitive/healing ability, because I could feel the importance of embodying as much of my soul energy as possible so that I could be of the greatest service. What I didn’t anticipate at first was that, to get to the next vibratory level, there was a lot of inner work to be done! To hold higher and higher levels of light in your bio-energetic matrix, you have to progressively let go of old energies, patterns, hurts, and ways of thinking and being that are not in resonance with your newly emerging reality. You have to clear the way, and sometimes you have to take an honest look at the shadow. Sometimes that process doesn’t exactly feel graceful, as you didn’t know before you began exactly how much was hidden inside that would come up for healing. Sometimes you might discover splintered and wounded parts of yourself that are crying out for love, understanding, healing, and integration. And the reward is finding the deep reservoir of love that is in your heart, and doing just that! Then you move to a higher vibration where new gifts, insights, and opportunities are awakened. But guess what: if you want to move higher yet, you often find that there are even more inner layers to explore and heal. I remember in my first year after my initial awakening, I was seeing a gifted healer who helped me to clear some lower energies. I asked her this question, “How long do you think it is going to take me to clear and heal everything?” She laughed and gave me this reply, “I’ve been on this path for twenty years, and I’m nowhere near done.” Here I am, seventeen years later, and I can say that I am certainly not done, either. I long ago accepted that it is a continual process, and it is not a contest or a race to become perfect. It is a journey of understanding, of opening your heart, and of expanding. It is about embracing more of who you are and the fact that you are already perfect. And in this process, we can all use loving support. Vesuvianite is one of my new favorite crystals to turn to for brilliant assistance when working on self-refinement and making positive changes. Vesuvianite, also known as Idocrase, exudes a powerful yet smooth energy that can clear, heal, and positively affect the chakras, the bodies of consciousness, and the layers of the auric field. It can grow in small pyramidal crystalline forms and in column or grain-like structures. It can be yellow, yellow-green, pink, purple, red, brown, grey, or white, but is most commonly seen in yellow-green and pinkish-purple. Vesuvianite definitely has a special energy that reaches out and grabs you in a loving way. I found this beautiful specimen, pictured left, sparkling at the bottom of a glass display case in a Hawaiian crystal shop last month. I didn’t know anything about the properties of Vesuvianite, but the moment I held it, I felt so much sweet heart energy flowing through my body that I knew I had to have it. Later, in meditation, I felt the presence of the Divine Feminine and saw visions of many of her faces: Mother Mary, Quan Yin, Mother Earth, beautiful young fairy maidens, and a wise Native American Grandmother Elder. And I felt a sense of urgency and got the distinct impression and that this crystal wanted me to write about her immediately, to help spread awareness that her gifts are available to help humanity during this crucial time. The energy of Vesuvianite feels to me like a warm glowing ball of honey that expands out in all directions; healing, smoothing, and aligning all energy in its path. It is a versatile crystal that can be consciously worked with over any chakra to bring it into a higher level of health and functioning. It has the ability to adjust to the needs of the situation. Since I am new to working with Vesuvianite, I first tried it over all of my own chakras to see what would happen. My root chakra was a little low on energy to start, and the Vesuvianite started to replenish it by powerfully infusing energy into my root chakra in a way that felt like a solid flow of light. My sacral and solar plexus chakras had low energy and also some blockages in them, and the Vesuvianite started pulsing so strongly that it was bouncing on my belly. I felt it begin to absorb and clear the blockages, and then the pulsing finally calmed down. When I placed it over my heart and throat chakras, it just hummed there sweetly and amplified the good energy. I felt waves of euphoria and joy. Then when I got to my third eye and crown, I felt a very gentle pulsing as it filled these chakras with light. I also saw lots of colors and got a sense that these chakras were being activated or upgraded. It was amazing to me how clear and easy it was for me to literally feel in my body the energetic workings of this crystal. Crystal expert, Melody, writes that Vesuvianite increases clairsentience, or the ability to feel energy, and my initial experience with Vesuvianite certainly validates this. This makes Vesuvianite an idea stone to support healers, psychics, or therapists of any kind, as it can assist in tuning into clients to sense what is really going on. And of course, it is equally useful to any person who is spiritually aware and working on themselves so that they can tune into their own energy and body for self-healing. Perhaps one of Vesuvianite’s most important qualities is the ability to assist in releasing lower thought-forms and emotional states that are standing in the way of spiritual growth and forward movement. When you work consciously with Vesuvianite in meditation for healing, you will notice that its sweet energy wants to assist you in letting go of heavy energy that holds you back. It does so by helping you to first recognize patterns of fear, unhealthy thoughts, stuck anger, and unresolved emotional pain, and it can reveal where these are residing in the body. Then if you place Vesuvianite over these highlighted areas, it infuses them with a healing balm of loving energy, helping you to gently dissolve these. Vesuvianite, like the Divine Feminine, works gently but powerfully, and at a pace that is not overwhelming to you. In addition to clearing, Vesuvianite can also help you to connect and unify aspects of your energy so that you come into greater wholeness. Sometimes when we go through life and encounter difficulty, we create sub-personalities that hold discordant energies. One theory is that part of our soul essence is assigned to each sub-personality, and that is part of the mechanism of soul fragmentation. We can and sometimes do push these into the background as a coping mechanism so that our psyche and conscious mind is not overwhelmed. But as we move forward on our spiritual growth journey, there comes a time when we must connect with these wounded aspects of ourselves to heal them and to reintegrate them. Vesuvianite can help you to create a loving and safe inner space when this time comes. It can lend you the courage and assistance to locate these parts of yourself and to face them with love from your higher self perspective. And the warm honey energy of Vesuvianite can act as healing glue to mend and ease the integration. If you feel ready for soul retrieval or soul integration work, you might also consider finding a qualified shamanic practitioner to facilitate this healing process, as it can be emotionally intense. Another form of disconnection that we might experience is between the different bodies of consciousness. We have a physical body, an emotional body, a mental body, and various levels of etheric/spiritual bodies, depending on what model you follow. Sometimes our different bodies are out of sync or alignment with each other, and Vesuvianite can help to correct this. It exudes a unifying energy that resonates the bodies back into harmonious and proper alignment. Crystal expert, Naisha Ahsian, wrote something that really felt right to me. She said that Vesuvianite is especially good at aligning our mental body with our physical body and reality. Have you had the experience of thinking you would like to start a new health regime, only to find that you keep eating Snicker bars and washing them down with Dr. Pepper? Having your physical and mental bodies in proper alignment might cause you to pause and instead to go for the baby carrots. Since I’ve had Vesuvianite in my possession, I have noticed myself ordering organic beet salad at more than one restaurant instead of giving into my usual gluten and cheese-loaded standbys. Finally, in addition to the clearing and integration that Vesuvianite offers, it also helps you to access your higher self and to receive guidance about your true purpose. If you are in a space of needing to make a life change, Vesuvianite has been known to assist in becoming clear about the right direction and supporting positive, courageous action. I would now like to share a simple Vesuvianite meditation to help with clearing and aligning your energy, while also assisting you in connecting with your higher self for spiritual direction. You will need one Vesuvianite, which you should cleanse before and after this exercise. Begin by lying down and calling in your higher self, as well as any other spirit helpers you like to work with. Place the Vesuvianite over your heart chakra at the center of your chest, and place your hands lovingly over the Vesuvianite. Hold the intention that you are now going to perfectly clear, balance, and align your entire energy body. Take a deep breath, and then visualize and feel that you are breathing pure golden light into your heart chakra. 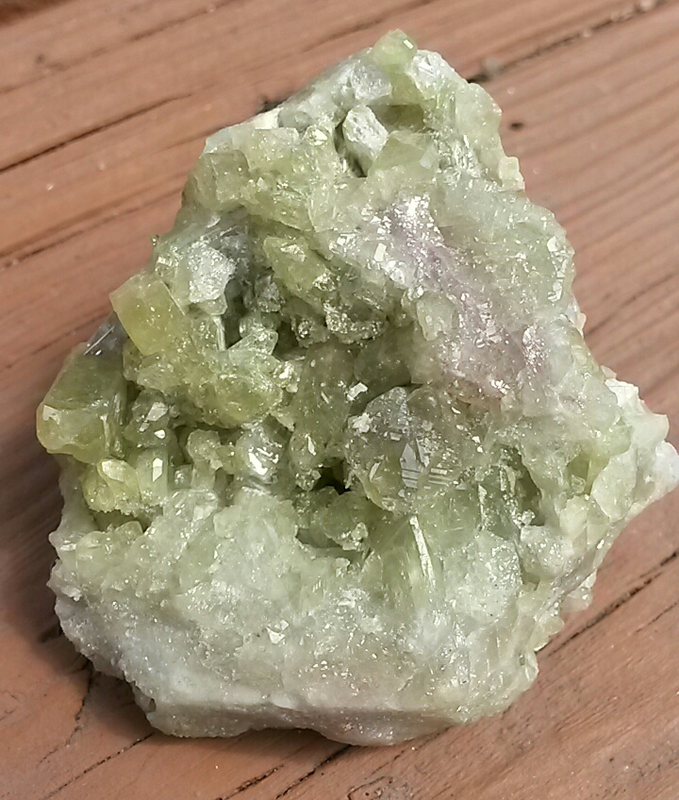 Allow a golden ball of honey light to form at the heart chakra, encompassing the Vesuvianite. This golden ball of light carries the Vesuvianite energy, and it is clearing, healing, and aligning all energy in its path. With each breath, feel the golden ball expand. It expands to encompass the throat, heart, and solar plexus. As you continue to breathe, it expands further to include the third eye through sacral chakras. And it keeps expanding to encompass the crown through the root chakras. The energy grows and expands with each breath, until you have formed a globe of honey light twelve feet around you in all directions. Allow the energy to purify, unify, and heal all energy centers and levels of your auric field. Intend it, feel it, and it is so. Next, move the Vesuvianite to your third eye chakra in the center of your forehead. Imagine a golden column of light forming a bridge from your third eye and linking to your higher self in the soul plane. Be open to any initial impressions or feelings that might come to you from your soul. Witness all of the beauty, love, colorful energy, and sheer brilliance that is your soul, and allow yourself to receive an infusion of soul energy straight into your body, mind, and heart. Ask your higher self to show you a vision of your highest, most joyful path and the greatest potential you can achieve in this lifetime. Trust whatever comes to you, whether it is a feeling, a knowing, or a subtle impression. Feel free to ask for clarification if needed. You can ask what your next step is in manifesting this, or you can ask any other questions that are coming to you. When you feel complete, send love to your higher self, and open your eyes. In closing, Vesuvianite is a gentle and powerful crystalline being that can lend loving support throughout the life-long process of spiritual growth. No matter where you are in your unfolding process, Vesuvianite can encourage you to gracefully move to your next level of self-love and spiritual awareness. It is a crystal that you will never outgrow–one that will perpetually expand your glow.